The 2014 Volkswagen Touareg is the product of a joint venture between Audi and Porsche, so its elegant styling is like nothing before seen with a VW badge. The Touareg’s aggressively-styled front fascia flaunts standard LED running lights that combine with standard 18-inch wheels to deliver a commanding on-road presence. 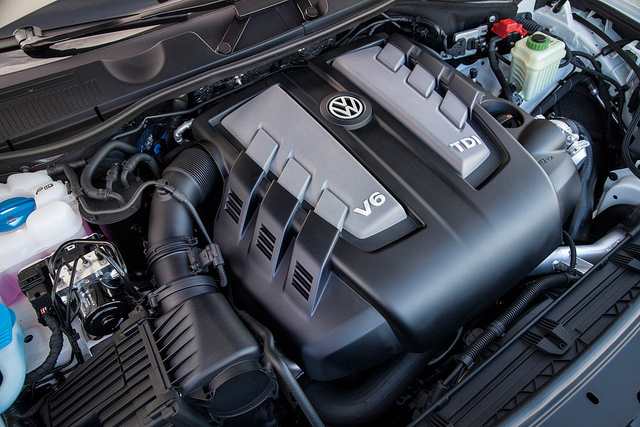 The base 3.6-liter V6 engine powering the 2014 Volkswagen Touareg generates 280 horsepower and 265 lb-ft of torque. An available turbocharged 3.0-liter V6 diesel engine pumps out 240 horsepower and 406 lb-ft of torque The is also a hybrid powertrain available that combines a V6 with an electric motor for 380 horsepower and 428 lb-ft of torque. The hybrid is the most powerful in the 2014 Touareg lineup, but its 20 mpg city and 24 mpg highway is not the most fuel efficient. The Touareg TDI’s diesel V6 returns an impressive 20 mpg city and 29 mpg highway, and the base V6 returns 17 mpg city and 23 mpg highway. According to Edmunds.com, the 2014 Volkswagen Touareg’s interior provides “a strong vibe of quality and craftsmanship,” and that is accentuated by a long list of standard features, including dual-zone automatic climate control, eight-way power and heated front seats, Bluetooth connectivity, touchscreen controls, and an eight-speaker sounds system. 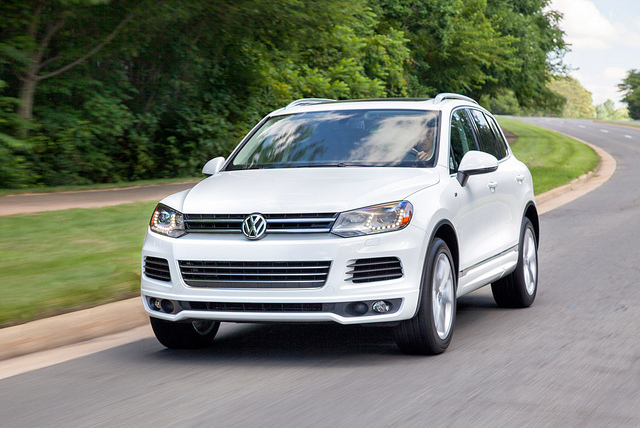 Standard safety features on the 2014 Volkswagen Touareg include hill hold assist, stability and traction control, antilock disc brakes, and a comprehensive suite of airbags. Rear- and top-view cameras are also available.